Nowhere outside Carcassonne will you find such a complete example of 6th, 7th, and 8th century walls in all of Europe. Carcassonne, a city of just 46,500 people and located 808 km south of Paris is on the edge of Cathar Country, a landscape littered with romantic castle ruins. Stay in Carcassonne or along the river below the old town, which will give you a romantic view of La Cite lit up at night. Lucca (birthplace of composer Puccini) is up in the Tuscan hills and surrounded entirely by 16th century walls. In the 19th century, trees were planted and now the ramparts can be walked or cycled. It is approximately three miles around the oval; you can walk it or rent a bike and pedal around. 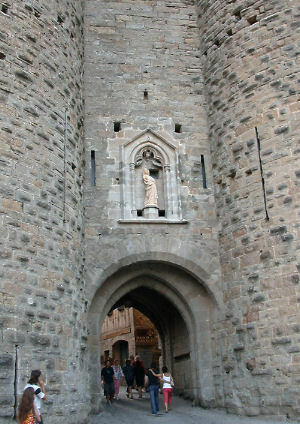 The medieval walled city of Rhodes (population 6,000) is surrounded by medieval walls with 7 gates, a moat and castle. The Knights of Saint John found safe haven here in 1309 AD. York has the longest and best-preserved town walls in England, estimated as weighing 100,000 metric tonnes. The walls are 3.4 km long and there are 5 main "bars" or gateways and 45 towers. There are also the famous York ginnels – 50 or so little thoroughfares within the city walls. These were medieval short-cuts which you can still use today to explore the city.